This is an original watercolor painting by American artist Hendrick Dirk Kruseman Van Elten. 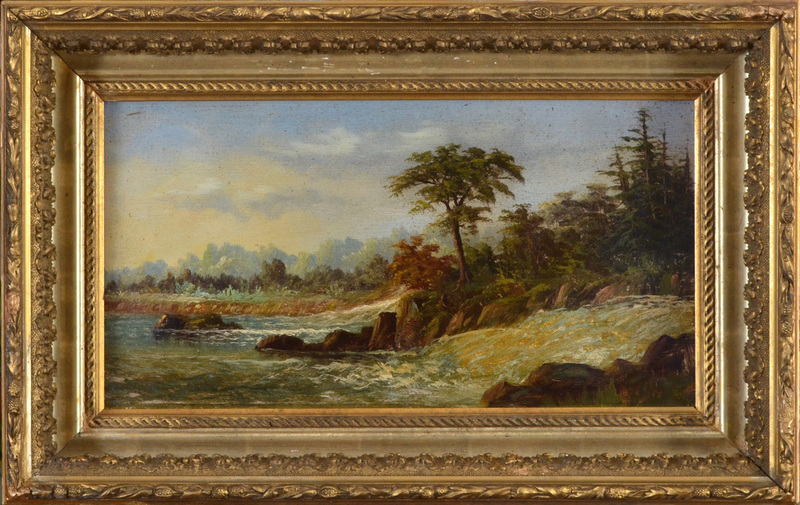 The painting came to us in what appears to be the original period frame with a gilt covered matboard. The painting measures 15X21 inches, the overall frame size is 30X35 inches. Clearly signed by the artist lower right corner, good condition, slight toning to the sky. This is a cool original oil on canvas painting of Nymphs in the forest. 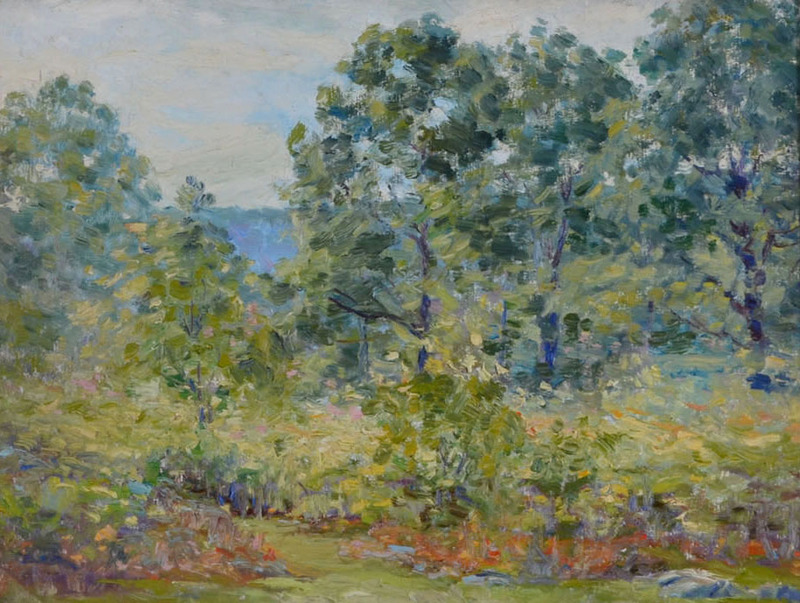 A fine tonalist work. It appears to be signed lower right but we cannot make out who the artist was. 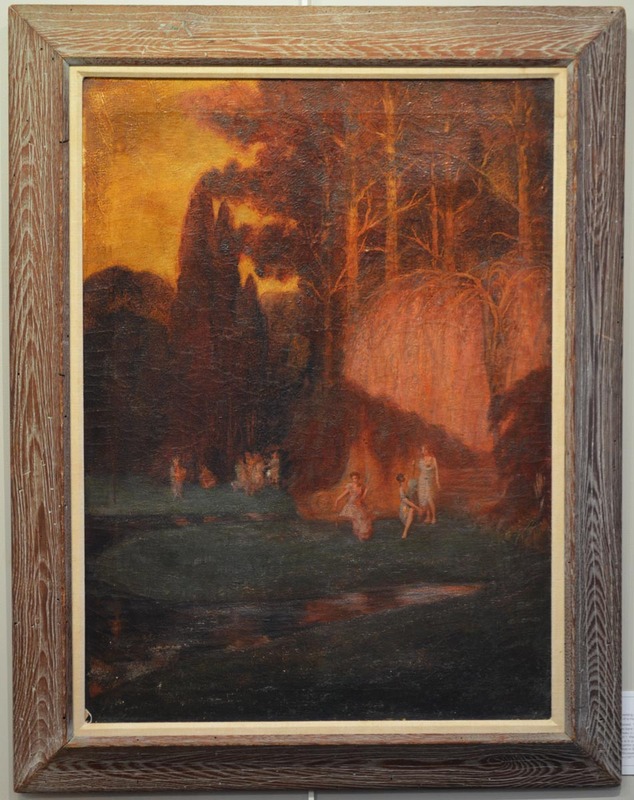 The work looks to be from the 1920's, The canvas measures 30X22 inches. 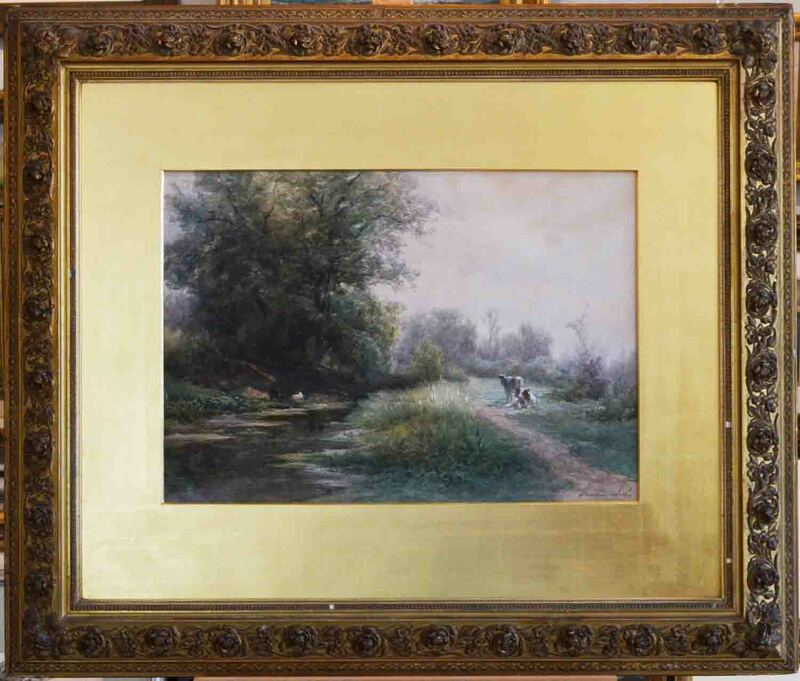 The canvas has be relined in the past, housed in a rustic frame that goes well with this tonalist impressionist work of art. 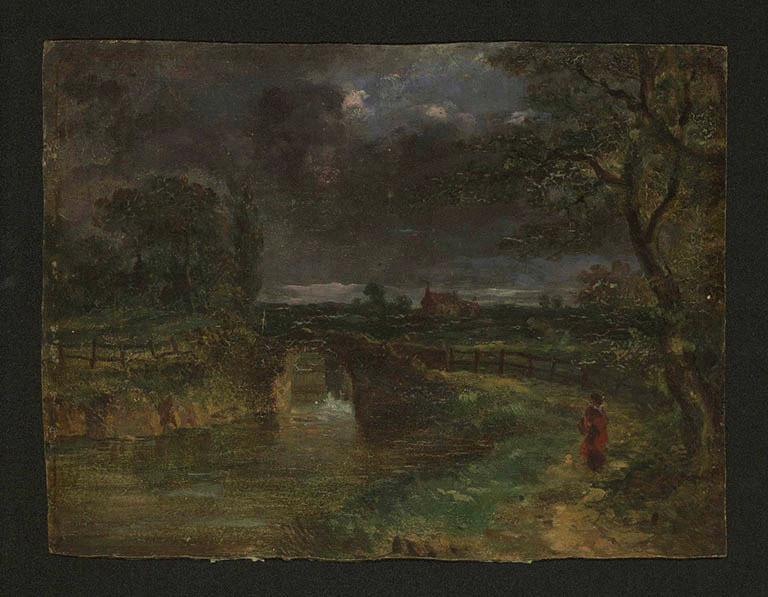 Oil on academy board, image size 7 1/2 x 9 1/4 inches, attributed to Albert B. Insley, obscure signature in l.r., c. 1890. Period gilt frame. 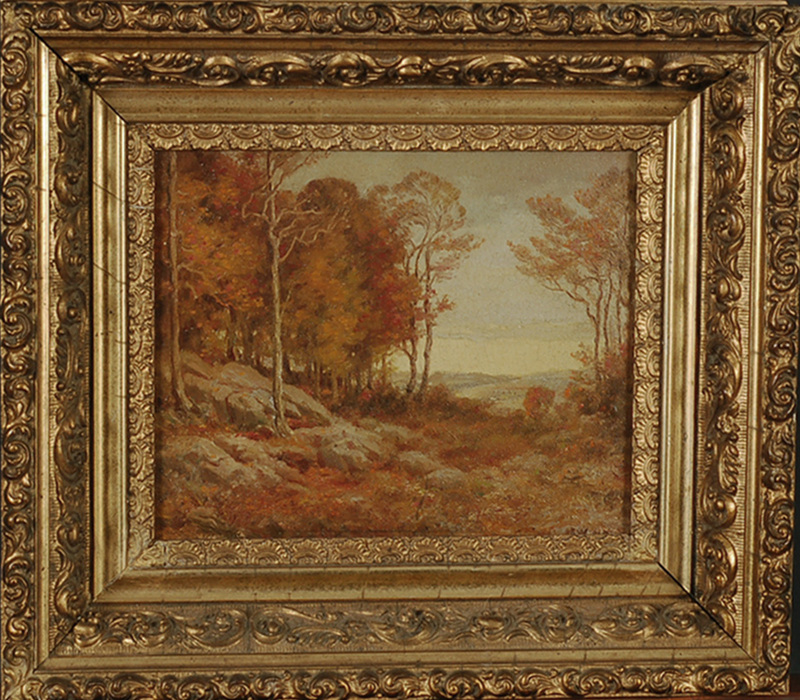 Lovely fall wooded scene with views of distant hills. This is a fine tonalist mountain landscape in winter, oil on board, American school painting, the painting is indistinctly signed l.l., weve been unable to identify the artist. 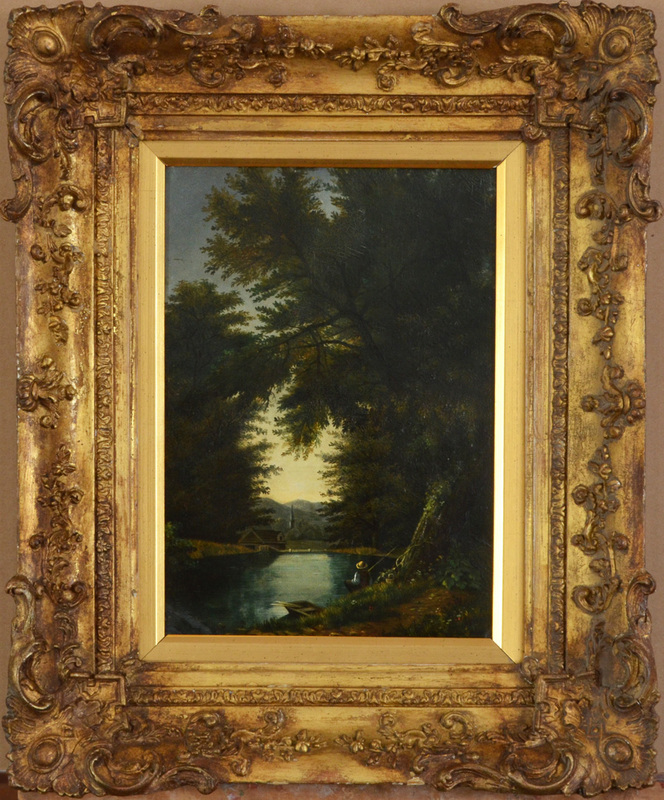 The painting is housed in a nice 19th century gilt frame. The painting itself measures 8X10 inches. This collage by Nora Unwin measures 15 1/2 x 19 1/2 inches and is matted and framed. 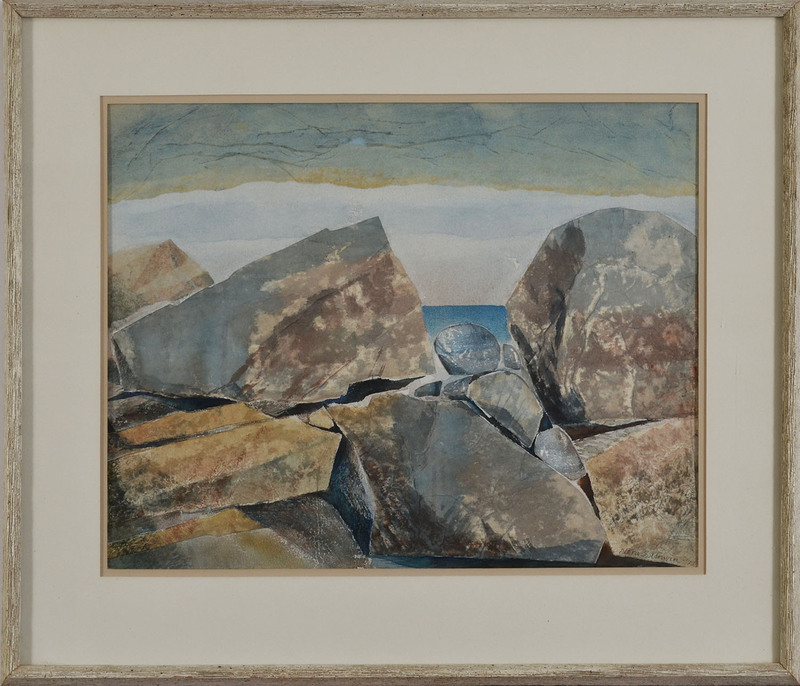 Created in 1972, Unwin gives the viewer a look past a rocky seawall to the water's distant horizon line. Her use of cloth, textured paper, glue and colored ink skillfully adhered to a painted background was one of her favorite mediums to display her genius, giving the viewer this three-dimensional effect. Signed and dated in the lower right corner. Nora Unwin grew up in England and studied art with Leon Underwood, then at the Kingston School of Art and the Royal College of Art before moving to the United States in the 1940s, settling in Wellesley, MA and Peterborough, NH. She was a renowned artist, printmaker and children's book illustrator. Her work won innumerable awards and was shown in more than forty one-woman shows. 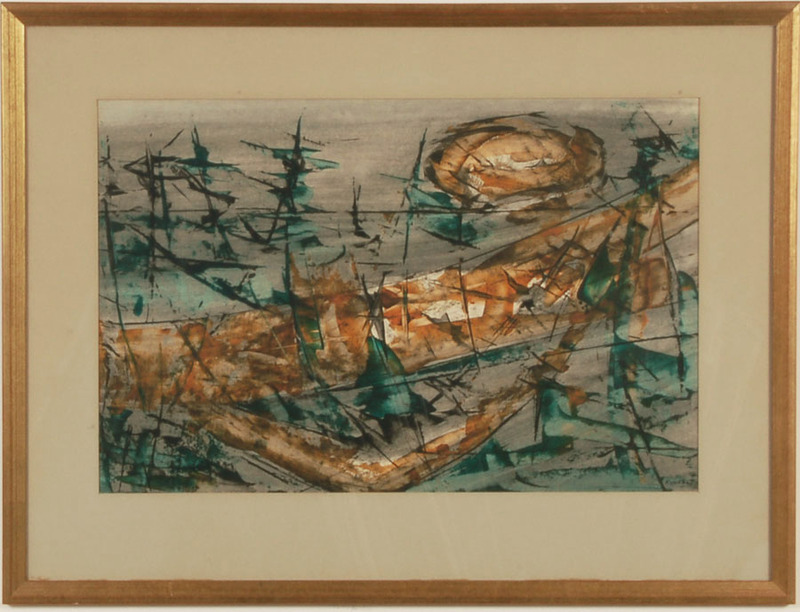 Mixed media on paper, visible size: 12 1/2 x 19 inches, signed lower right, framed. 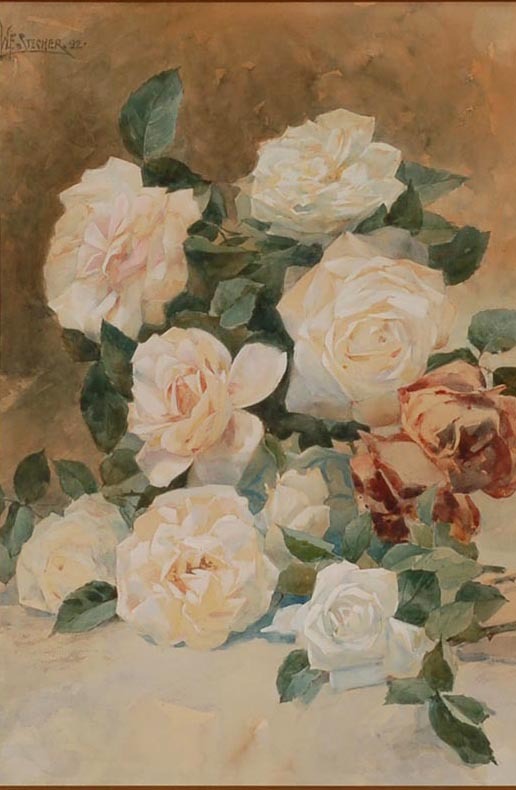 Watercolor on paper, visible size 18 5/8 x 13 1/4 inches, 1892, signed "W.F.Stecher.92" upper left, Stecher was a Boston painter and book illustrator. Unframed. This is a sweetly intimate portrait of a young woman, oil on board, 6 5/8 x 4 5/8 inches, c. 1920, signed lower right, framed. John Califano grew up in Italy and began showing his work as a young man, winning a gold medal in Naples, Italy. In 1881 he emigrated to the United States where he lived for several years in Chicago before settling in California. He was known for his California landscapes as well as portraits and genre scenes and showed his work at the National Academy of Design, New York, and the Art Institute of Chicago. 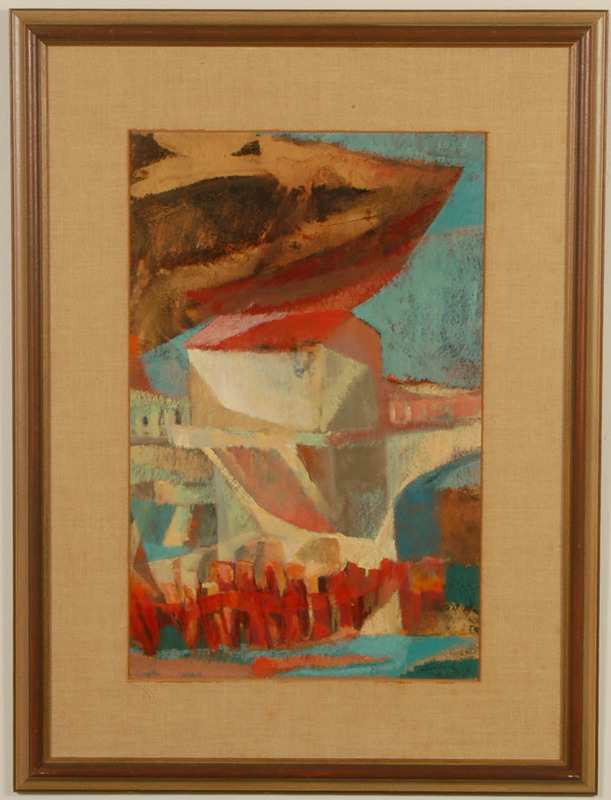 Oil on board, image size 7 1/4 x 9 1/2 inches, unsigned.